If you are looking for a blood test for liver function evaluation, Actually there are 8 tests for liver function testing. I must explain that liver is a principal organ, many biological process are controlled and managed by liver cells, so hat the liver status can be monitored by many methods and tests. Take LFTs when you are checking for the liver working status, General checkup in wellness and illness, checkup in pregnancy, and for checking up almost any pain such as Heartburn and difficult urination. In liver function panel tests we use the chemical substance, “usually enzymes” which synthesized or managed by the liver to check how well he liver cells are working. 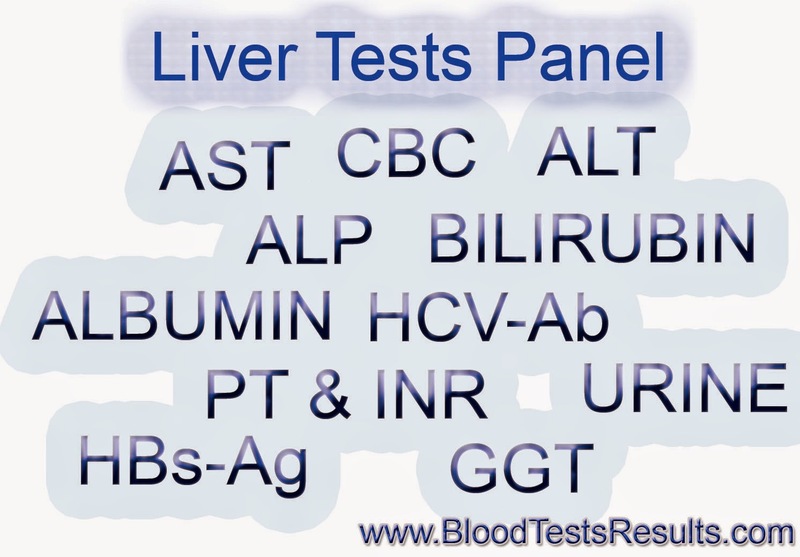 Very Specific liver function tests (LFTs) include PT, INR, albumin, and bilirubin. ascites, hematemesis, melena; fatigue or loss of stamina; history of alcohol or drug abuse). Who have impaired Liver function and needs for testing? Addicts to Alcohols or abuse drugs. Also Liver enzymes are very sensitive to irritability, allergic reactions, and constipation as well. AST and ALT is the main tests to assess liver function evaluation in most cases of liver diseases as hepatic inflammation due to viruses, alcohols, and others. When results come up with elevation in one or both enzymes, more medical tests must be taken for further diagnosis. Liver viruses tests: HCV-Ab, HBs-Ag, and HAV-IgM test for Children. If there is a yellow discoloration of the skin and urine, take a “Bilrubin test”. 5′ nucleotidase, or Gamma-glutamyl transpeptidase (GGT), these tests re specific for assess biliary ducts and bile function. Ultrasound and CT scan to evaluate Liver stones or accumulated fats on the liver which referred as “Fatty Liver”. If Fats are shown, you must take a fasting blood sample for cholesterol and triglycerides tests. If Viral testing and Scan show up negative results, take more tests as Alkaline phosphatse and CPK enzymes for assess in bones and muscles issues respectively. If All results come up Normal, then we may consider the raise in liver enzymes of a transient cause such as Constipation or even unmentioned medication by he patient. ■ Enzyme found in liver cells exclusively. ■ Used in diagnosis of liver, biliary, and pancreatic disease. ■ Enzyme found in cardiac muscle, liver, and skeletal muscle. ■ Used primarily to evaluate patients with symptoms of liver disease (jaundice, liver enlargement, fatigue, weight loss, ascites, etc.). ■ Main plasma protein; helps maintain osmotic pressure. Decreased albumin causes fluid shifts and resultant edema. ■ Levels decrease in renal or hepatic disease, acute infection,malnutrition, malignancy, diabetes, and many other chronic and acute conditions. ■ Bilirubin is a by-product of the the breakdown of hemoglobin. ■ Most bilirubin is chemically attached (conjugated) to another substance. This is called direct bilirubin. Unconjugated builirubin is called indirect bilirubin. Conjugated bilirubin is excreted in bile. ■ High bilirubin levels cause jaundice and are seen in liver disease and biliary obstruction. ■ In newborns, elevated bilirubin occurs with Rh or ABO incompatibility. Brain jaundice (kernicterus) develops at higher levels and can result in mental retardation, cerebal palsy, or blindness. ■ Enzyme found predominately in the liver, biliary tract, and bone. ■ Useful in assessing liver and bone disease. ■ ALP isoenzymes distinguish between liver and bone disease. ALP1 is hepatic; ALP2 is from bone. I have to mention some recommendation, the previous explanation is valid if you wan to go for general check up then such information will guide you, if you’re suffering from an illness or unknown pain please book an appointment and get you examined by a professional doctor.